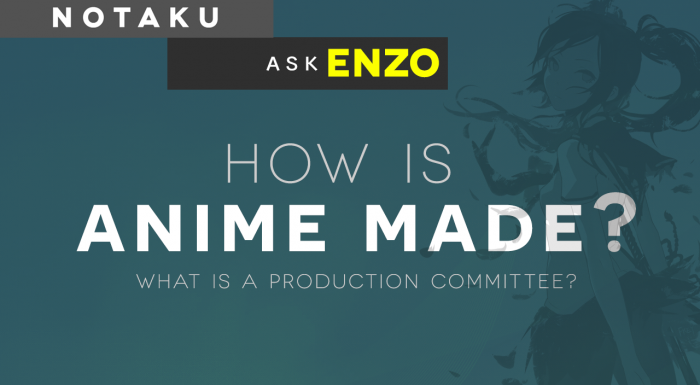 Notaku – Ask Enzo – How is Anime Made? This week’s Notaku Video is the first episode of a show called Ask Enzo. The idea for this show is to basically cover a topic related to the Anime Industry or Japanese culture, and have Guardian Enzo from Lost in America talk about it. The hope is to give more information and knowledge about specific, generally unknown aspects of Anime. The plan is to have a similar segment for myself, called Ask Setsuken, which will deal with the more technical aspects of the Anime and Animation (Which is is where my expertise lies). Episode 1: How is Anime Made? UPDATE 2: New Channel is live! This week, Guardian Enzo actually tackles the idea of a Anime Production Committee, and how exactly Anime is actually made. There’s also some nice little tidbits about how Anime actually makes its money back, how quality between series vary, and how certain series get continuations despite not selling particularly well on disc. Its pretty interesting stuff, and I highly recommend you check it out. Also please like the video if you enjoyed this week’s episode, subscribe to the channel, and let me know what you think of this week’s video in the comments (either here or on YouTube! ).